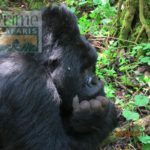 The national park is a UNESCO world heritage site and an exceptional habitat for the eastern lowland gorilla subspecies, Gorilla berengei graueri. It is also a protection of the rainforest. 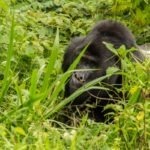 Near the western bank of Lake Kivu lies the national park; in the eastern part of the Democratic Republic of Congo near Bukavu town, South Kivu province. It covers a total area of about 6,000Km² and lies on the Western flank of the Albertine rift valley in the Mitumba mountain range; with an elevation that ranges from 700 to 3,300m altitude. The mountain side covers an area of about 600Km, with altitude ranging from about 1,800 to 3,330m; the tropical rainforest has an altitude that ranges from about 700 to 1,200m. About 10% of the park is comprised of high mountains dominated by extinct volcanoes, Mt.Kahuzi and Mt. Biega; which are literally the dominant physical features in the park. The parks name is derived from the two extinct volcano mountains.The Mountain areas and lowland terrain are separated by a 7.4Km corridor. 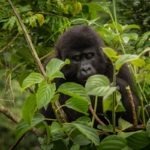 Lying east of the Democratic Republic of Congo, Maiko is a National Park divided into 3 sectors that spread in a total area of about 10,885Km². It is shared by provinces of North Kivu,Orientale and Maniema. 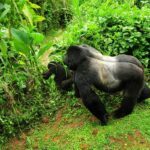 The national park is bordered by Lake Kivu to the East and the town of Kisangani to the West at a distance of about 515Km. It stretches from Oslo river and extends north to the Lindi River with an elevation that rises from about 600 to 1300m altitude. 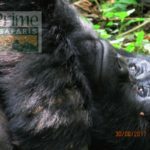 The parks history dates back as early as 1949 when it was declared a hunting reserve by the Belgian Colonial administration, Bakumu Hunting Reserve. The word Bakumu is derived from the name of the native tribe in the region, ‘Kumus’. However, the original plan for the park is believed to have been preventing the exploitation of mineral resources and protecting wildlife. Following the assassination of Prime Minister Patrice Lumumba, a rebel group known as Simba took refuge in the park in 1964. The word samba is derived from the Swahili language of Kenya and Tanzania which means Lion. Led by Gaston Soumialot and Christophe Gbenye, most of the Simba members were from the Kivu and Orientale provinces. The Simba group made a living by carrying out poaching and illegal mining in the park. 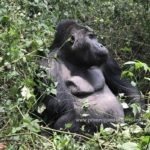 The Garamba National Park covers an area of 4900km2 and has been under the management of African parks limited since the year 2005 in conjunction with the InstitutCongolais pour la Conservation de la Nature (ICCN). Garamba National Park is considered among the old and notable African parks standing as one of the exact wilderness areas. The Garamba National Park appears as an open vast protected area with undulating grasslands that set the amazing scene for rewarding encounters like elephant herds, the buffalo herds, the Uganda Kob with less appearance of Giraffe and Roan Antelope which appear unexpectedly.